In deep 8-inch skillet, place chicken in single layer. Add broth; heat to boiling. Reduce heat to low; simmer 10 minutes. Remove from heat; let stand 10 minutes longer. Meanwhile, in food processor or blender, process 1 avocado, the garlic and lemon juice until smooth. While processor is running, gradually add water and oil, processing until dressing is smooth and emulsified. Remove chicken from liquid to plate; shred chicken with 2 forks. In large bowl, toss salad greens, thyme and half of the dressing. 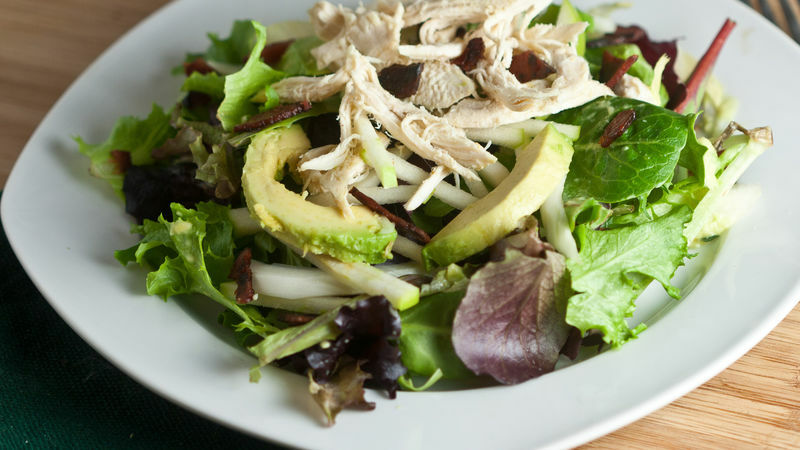 Top with shredded chicken, apples, 1 avocado, the fennel and turkey bacon. Drizzle with remaining half of dressing. Divide salad evenly among 4 salad plates. Spring mix salad greens are easy to find, but herb salad greens are a fantastic substitute. Use a combination of arugula, watercress, mustard greens, parsley, cilantro and endive. Squeeze a little lemon juice on the cut apple and avocado to keep it from turning brown too quickly, or cut them just before you’re ready to serve the salads.